Does anyone know a quick fix for plantar faciitis? No? I knew you all would say that. There is never a quick fix for any running injury. Usually, you have taken months working on your injury, so why would it be fixable within a few days or a week? Plantar faciitis is a runner’s worst nightmare. It is difficult to heal and can take a long time. What is plantar faciitis? It is when you strain or tear your plantar facia, which is a thick band of tissue along the bottom of your foot. It acts like a shock absorbing bowstring. 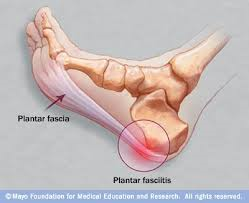 When you injury it, the plantar facia either gets inflamed or it thickens and doesn’t work the same. The pain is most commonly in the heel of your foot snuggled right in against your arch and toward the inside of the foot. Sometimes it is felt in the arch too. How many runners get it? about ten percent of runners get plantar faciitis at some point during their running careers. Risk factors? There are several things that make a person more susceptible to plantar faciitis including, long distance running, ballet, standing for long periods of time, obesity, high arches, and flat feet. How do you get it? there are a few different ways you can end up with plantar faciitis. First, you can get it by wearing shoes that are old and worn out or don’t support your arch enough. Second, you can get it from over training and increasing your miles by more than ten percent a week. Third, you can get it just because the running gods say you get it. In other words, the doctors can’t always figure out what caused it. What do you do about it? As always with an injury you are going to want to reduce your miles or even stop running. The next step is to get the swelling/inflammation down by using ice, elevation, and compression. You can also use anti-inflammatory medication if you choose. You also need to stretch the bottom of your foot by pulling your great toe back toward your shins along with stretching your calf and Achilles tendon. The reason you want to stretch the calf and Achilles is they are all connected and a tight calf or Achilles will contribute to the problem and prevent it from getting better. So show your foam roller some love. Freezing a water bottle and rolling your foot on it seems to help many runners. Rolling your foot over a golf ball, lacrosse ball, or an extra special ball you get at the running store also helps break up some of the scar tissue. You can also tape your foot using KT tape or Rock Tape which will support the Plantar Facia. How do you prevent it? Make sure you are replacing your shoes when they are worn out. Stretch your claves, Achilles, and feet regularly. Don’t increase your miles by more than ten percent a week. Strengthen your feet, ankles, and calves. Finally, pray to the running gods. Some articles out there that say plantar faciitis will heal on its own, and that there is no research that supports any of the treatments people use. Some runners choose to run through the pain, which causes it to take even longer to heal. My thoughts on this are, you’re never going to go wrong with resting, icing, elevating, and compressing a soft tissue injury. Be an active participant in your recovery. Next Article How often should I race? Ugh. I’m not a runner, but have flat feet, and did ballet for years (it is still my preferred method of exercise, though only practiced in the privacy of my home these days). And have been known to do stupid things, like do over 9,000 steps in a few hours, mostly stairs, after a long period of inactivity, while carrying heavy boxes. Yeah… that was a year and a half ago, and I have JUST mostly recovered.